The burnt jam and the floppy profiteroles will have to wait! I had such a good lunch yesterday, made by my own fair hand that i had to write about it. The main reason for me wanting to write about it and do a recipe is due to the fact that i did it all while half awake – ie 7am, following a not particularly good night’s sleep! Flop into the kitchen, fill kettle and switch it on. Put rice & crumbled stock cube into saucepan. Pour in boiling water plop in the bashed clove of garlic. I bashed mine by putting it under a fork and leaning on it, this ensured that A) it was still intact to pick out once the rice was done and B) my hands didn’t smell of garlic for the next few hours. Dice the shallot and add it to the boiling rice about halfway through the cooking. Chop up the bacon and add to the water as well. It might seem odd to do this but the bacon doesn’t loose its taste and you’re not creating any extra washing up by frying it. 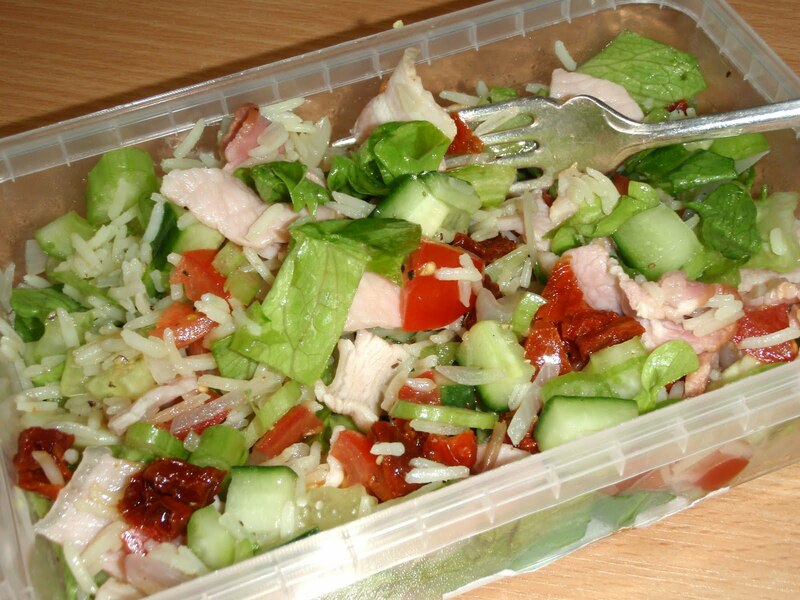 While the rice, shallot and bacon are finishing; chop up the cucumber, tomato, lettuce and celery. Drain the rice and sloosh cold water quickly through the sieve to cool it down. While it’s draining, line the bottom of a Tupperware box with the lettuce. 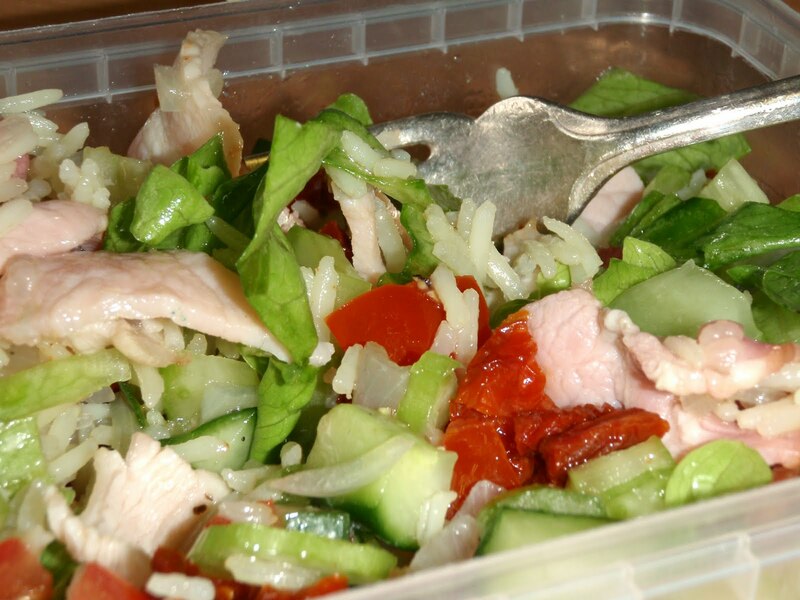 mix together the rice with the chopped tomato and the cucumber and tip it on to the lettuce. Sprinkle the celery on the top of the whole lot. And there you have a fantastically yummy salad that is pretty healthy.